The work of a sustainable transportation reporter can be a lonely lot. But it’s a lot less lonely now that two McClatchy reporters, Curtis Tate and Greg Gordon, have taken up the mantle of exposing wasteful road expansion. With their far-reaching and well-researched three-part series, published last Sunday, Tate and Gordon brought stories of highway corruption and waste to a mainstream print audience. They spent four months researching the series, digging into 15 years of campaign finance records and interviewing leaders inside and outside of the transportation field. Tate is from the same hometown as Rep. Hal Rogers, the powerful Kentucky Republican who wields the gavel of the Appropriations Committee in the House. Tate couldn’t help but notice that Kentucky was using its federal formula funds to build Rogers’ pet project (I-66) while borrowing against future federal highway funds to do badly needed maintenance and repair work. The state has even used $4.2 million in interstate maintenance funds for I-66, despite the fact that the project didn’t meet the necessary criteria. But this story doesn’t end with Kentucky. The push to get I-73 built in South Carolina is just as unsavory (although it doesn’t end, as the Kentucky story does, with the former governor and 15 members of his administration getting indicted on corruption charges related to politicking in the transportation department). Environmentalists had an alternative plan to upgrade the parallel U.S. 501 at a tenth of the cost, without destroying the wetlands that lie in the path of the proposed route. They said it would provide nearly the same economic benefit. Power brokers in Congress and business have secured hundreds of millions of dollars for related activities, like building a bypass. I-73 was designated a “Project of Regional and National Significance,” entitling it to a pot of money for such projects that really ended up being a slush fund for Congressional earmarks. Thankfully, the road still hasn’t been built. Neither has the lower-cost alternative. The state simply ran out of money. South Carolina has the benefit of having a state infrastructure bank that’s been spotlighted as a model for the nation. But that infrastructure bank is out of money, too. South Carolina’s state-owned highway network grew during a spending splurge to more than 41,000 miles, the fourth most in the nation, even though the state ranks 40th in land area. Numerous state officials criticized rural legislators who demanded that the proceeds of a nickel-a-gallon hike in the state gasoline tax in 1987 be used to produce a maze of outlying highways. As a result, some four-lane state highways led “from nowhere to nowhere,” such as from Abbeville to Greenwood, with a combined population of 28,000, said Republican state Rep. Tracy Edge of North Myrtle Beach, an I-73 supporter. But times have changed in South Carolina, which was swept by anti-tax fervor and hasn’t raised its 16-cent-a-gallon gas tax in a quarter-century. It’s now the third lowest in the nation. Jim Warren, the state Transportation Department’s chief financial officer, said South Carolina faced “a broken paradigm” in its highway funding. Slow to fully recognize the impact of these combined forces, state officials kept commissioning highway projects until the money ran out in the summer of 2011, forcing some contractors to wait months for payment. The state also deferred maintenance, which multiplies future repair costs. In December, South Carolina’s Transportation Infrastructure Task Force reported that it would cost $48.3 billion to bring the state’s highways to “good” condition over the next 20 years – exceeding anticipated funding by $23 billion. The McClatchy series doesn’t stop at Kentucky and South Carolina. Texas, California, and North Carolina also come up billions and billions short of what they’d need to keep their road systems in good repair. Florida and Washington state are finding that, with federal help less reliable and less robust than in recent years, they just can’t keep their transportation networks in good condition, much less build new infrastructure. States are “spending too much on building highways and too little on fixing them,” write Tate and Gordon. And, they say, it’s going to cost six to 14 times more to overhaul those roads later on than it would to keep them in good shape now. The authors point to familiar culprits: aging infrastructure, the stagnant and weakening gas tax, political concerns – and they add to that list the lack of “well-defined national transportation goals,” saying that Washington has ceded control of transportation decisions to the states, “leaving a large portion of federal money up for grabs for those with the most clout.” Although the federal government pays for up to 80 percent of states’ transportation spending, they don’t say nearly enough about where that money should go. To make matters worse, they don’t collect or publicize data about where it went. What South Carolina did – put the brakes on I-73 – is actually a brave and difficult thing for a state to do when a project has developed a momentum and a constituency of its own. Tennessee has done the same thing, notably with its part of I-69, which Kentucky is still champing at the bit to build. Pennsylvania did it years ago under Transportation Secretary Al Biehler, who now advises other states on how to live within their budgets. MAP-21 paid lip service to keeping states accountable for maintaining their roads — which would keep them from expanding highways — but many advocates worry the performance measures don’t have enough teeth to make a real difference. Bravo for Tate and Gordon, and for you, Tanya! State highway agencies deserve scrutiny and critique proportional to their massive budgets; all too often they skate by without it and that’s very dangerous, especially to taxpayers whose money they’re wasting. I’m glad there were no specific complaints about I-86 in New York in the expose. That project is a fix-up an existing road, Route 17, and some modifications in some sections to bring it to interstate standards. And I agree with it. Route 17, however, parallels the former Erie Railroad, one of two main rail routes across New York, and it is is also in rough shape. It is mostly owned by Norfolk Southern, as part of its share from the break-up of Conrail. Unfortunately, while Norfolk Southern and CSX are making major investments in rail routes from Baltimore and the Hampton Roads area of Virginia inland, with federal and state support, there are no significant rail freight investments going on in New York. In part because railroad property is heavily taxed here, so if they pay to invest in their New York State infrastructure, they’ll pay again in property taxes. 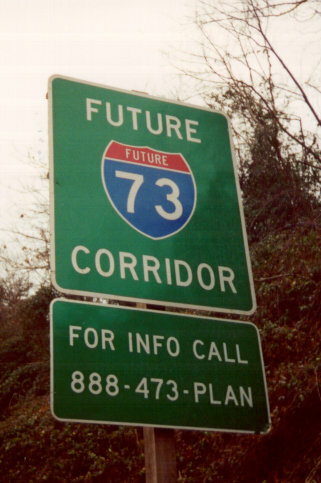 The Thurway and Route 17 (future I-86) are not so taxed, of course. Among other things, this will affect the future competitiveness of the Port of New York and New Jersey compared with the Port of Virigina for freight to and from inland markets. It’s nice to see that this sort of reportage hasn’t died out in mainstream newspapers. Great work, and timely. I wonder what the Tea Party watchdogs make of all this? Just raise the gas tax. Or better, repeal it and replace it with a tax on miles per year per pound of vehicle, so those who drive more or drive unnecessarily heavy vehicles pay more. Keep upping the tax until the money brought in meets the needs of maintenance and expansion. Since expansion is expensive and almost always entirely unneeded, having the gas tax (or mile/pound tax) high enough to cover it will discourage driving, thus eliminating the need entirely for expansion. I think the interstate highway system was among the worst ideas ever foisted on this country, at least in a century. I ensured that the car would become the default transportation system, a monolith too big to break. It made lethal pollution inevitable, wrecked small towns and big cities alike, fathered the destruction of open space through suburban sprawl, and purposefully torpedoed alternative transportation. Now we’re stuck with the monstrosity for the foreseeable future. Our only remaining course is to treat the system as a mistake to be remedied as well as possible. That should be the basic premise of further transportation planning. By allowing some corporations to lay tracks on some of them? Grade-separated, limited access right of way will continue to have great value. If demand falls, eventually some of them could be repurposed. Not all new highway projects are created equal. Some are really badly needed, such as I-11 Phoenix-Las Vegas (which is 40% upgrades, actually, plus a bridge over the Colorado River already opened in 2010). Those cities were at most medium-sized cities when the system was designed, today they are among the largest metros in the nation and top the charts of fast-growing areas, save for a brief hiccup due to the financial crisis. They barely need a decent highway link. Thanks for bringing attention to this great series — and keep up your own muckraking on these boondoggles. These highway expansions make less and less sense in the face of tight budgets and flagging vehicles miles traveled since 2004. Tea party where art thou? I’m a big road fan, but I don’t have a problem with gas tax dollars being used for bike paths, because that gets the bicyclists the hell out of my way when I’m driving. Bike lanes are good, also, as long as automobile lanes are not dropped to make way for them. 1) What do you define as “unnecessarily heavy vehicles”, and specifically do you mean trucks? 2) always entirely unneeded, having the gas tax (or mile/pound tax) high enough to cover it will discourage driving – again do you also assume trucks? The unspoken assumption — that the interstate highway system was once a “good thing” has been hijacked and perverted by politics, is false. The bill was flawed from its initial passage in 1956.